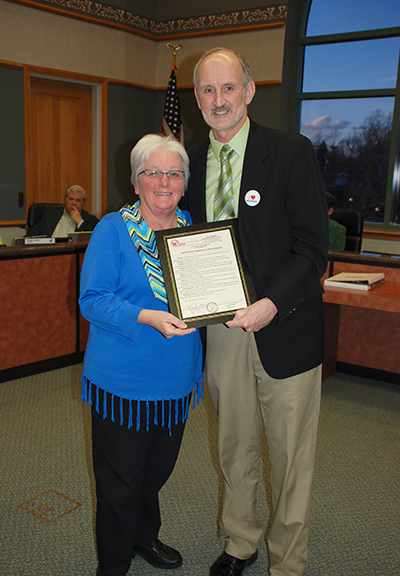 Mayor Ron Gunter and the Westmont Village Board recently presented a Proclamation to the SEASPAR organization in honor of their recent 40th Anniversary. SEASPAR Executive Director Susan Friend accepted the Proclamation on behalf of the organization and showed a video about SEASPAR and the people they serve. SEASPAR, which stands for South East Association for Special Parks And Recreation, provides programing and recreation for people with disabilities residing in its twelve community service area. Westmont was a charter member of SEASPAR when it was created in 1976. Mayor Gunter, who has been a SEASPAR board member for more than 20 years, and the Village of Westmont thanks SEASPAR for all they do for the Village of Westmont and surrounding communities.